Fun colors -- fun textures -- FUN TOY! 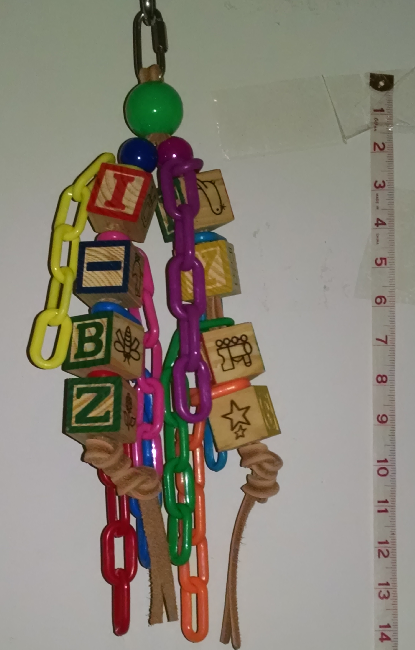 Colored plastic chain (1-1/2") dangles from 3/8" grooved veggie tanned leather, strung with large alphabet blocks, hangs from stainless steel quicklink. Contains no cut/open chain links. About 18" long. 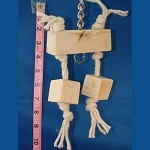 My parrot loves this toy...blocks and other soft woods are is favorite...he loves to destroy toys and this one keeps him busy for hours. The different textures of leather and plastic give him things to pick at, climb, and explore while the wood gives him the chewing experience he craves.